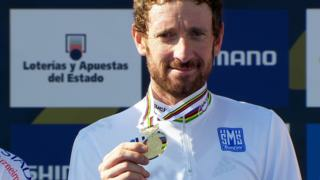 Britain's Sir Bradley Wiggins wins the individual time trial after a thrilling finish at the World Championships in Ponferrada, Spain. The Sky rider beat defending champion and three-time winner Tony Martin of Germany by 26 seconds over the 47.1km course, with Dutchman Tom Dumoulin third. Victory gives the 2012 Tour de France winner a world time trial title to go with his national and Olympic successes at the discipline.